I captured this wide-angle candid of the bride and groom's first dance as husband and wife just as he was about to give her a spin on the patterend historic floors of the Union Station Rotunda in downtown Tacoma, where their wedding reception took place. By using my 15mm fisheye lens, I was able to capture much of the detailed floor and ceiling, plus three art exhibits by world-famous artist Dale Chihuly: a glass chandelier, a wall of paintings, and the Monarch Window hung with orange glass disks. 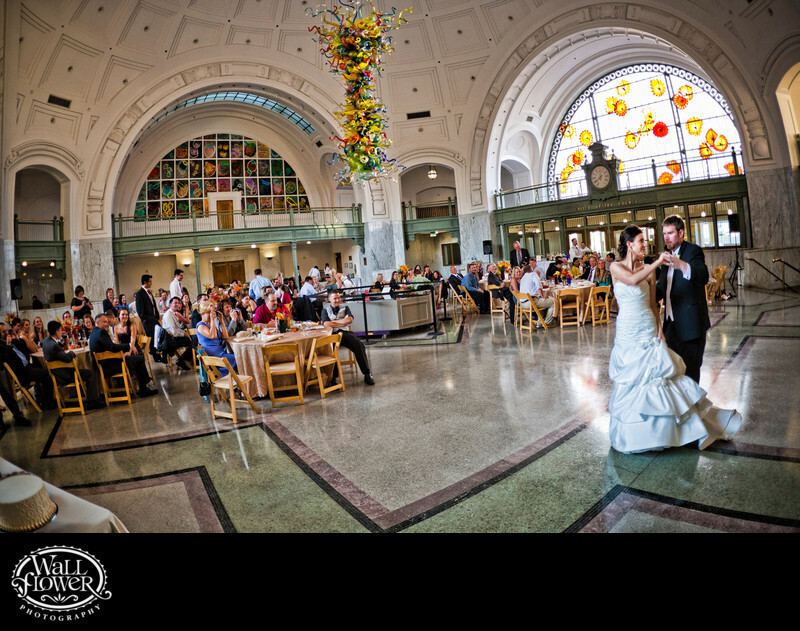 To see lots of photos of weddings photographed by Wallflower Photography at this venue, visit our Tacoma Union Station wedding portfolio website at www.tacomaunionstationwedding.com.